Compact, Reliable & Low Cost, that's what Fuji Electric's new PXR series controllers are all about. The PXR series, the newest member of the Fuji controller family, features a Waterproof front structure, Short Depth & Large LED display size. Abundance of features packed in the PXR makes it the most preferred controller in the Process Industry. Apart from the standard Auto-tuning & Fuzzy Control, the PXR also carries a Self-tuning mode, whereby the controller learns the process behavior and optimizes the control action. Some of the Low cost Optional features include: Re-transmission Output, 16-step Ramp/Soak Function, RS-485 (MODBUS) communication, Digital Input, Timer Function, Heating & Cooling control, Heater burnout Alarm, Programmable process Alarms (upto 3 points) etc. The PXR series is available in 1/32 DIN, 1/16 DIN, 1/8 DIN & ¼ DIN sizes. The new PXR4 controller is packed with features, to meet a wide variety of needs in the process industries. Low-cost options include RS485 communications, digital input, timer function, heater burnout alarm, dual outputs, and programmable alarms. One of the most impressive features is the large LED display - larger than any other 1/16 DIN controller on the market. The faceplate, designed for NEMA 4X (IP66 equivalent), is watertight and corrosion-resistant. The easy-to-use 3-button keypad allows for programming similar to the popular PXW controller. The screw-terminal on the back further reduces the cost by eliminating the need for sockets. The controller has all the standard features that you expect from Fuji Electric's superior controllers, and more. In addition to auto-tuning and fuzzy control, it now comes with self-tuning - an innovation in the control field. It automatically retunes the controller under certain conditions, without the need to revert to auto-tuning. The standard 8-segment ramp/soak feature has been expanded to include two patterns that can be linked to create a 16-step profile. 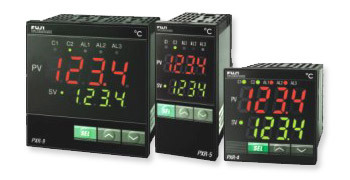 The PXR4 accepts temperature and process inputs, and offers two control outputs and two programmable alarms. Remote monitoring of up to 31 controllers at a time is possible with the RS485 option that uses the industry-standard Modbus™ protocol. The purchase of a PXR4 with PC-communications includes our free Windows®-based software, PXR-LITE™. Now, you can easily set up the controller with the new program configuration loader option with Windows®-based software. Programs for different applications can be saved to and from the controller. Call for more details.